Sonos has announced the release of new, higher-powered, more fully featured Sonos Amp, which promises to deliver twice the output of its popular CONNECT:AMP at a cost of just $100 more. The new Amp, which will be released globally in February 2019, will be available to custom installers in the US and Canada starting two months earlier. Why custom installers? That mostly boils down to the fact that the Amp is designed for custom installation. It features a rack-mount design and a focus on smart home integration. The Amp also boasts and HDMI port with Audio Return Channel, so it's not just a music streamer; it can also serve as the centerpiece of a stereo home AV setup. And if you're just using its output for multiroom audio, it can be configured as stereo or dual mono. 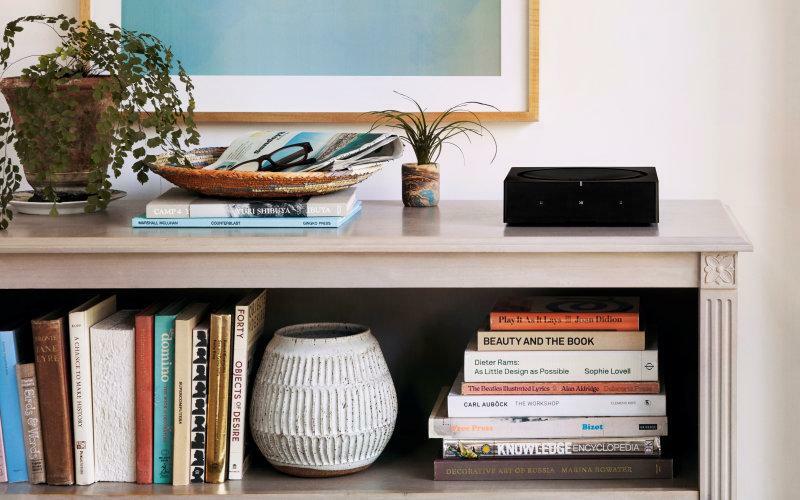 Today, Sonos (Nasdaq: SONO) unveiled the all-new Sonos Amp, a powerful and versatile home audio hub that powers traditional wired speakers with sound from nearly any source, and fully integrates these speakers into Sonos' easy to use wireless home sound system. The all-new Amp is twice as powerful as its predecessor, supports Apple's AirPlay 2 and more than 100 streaming services, and includes an HDMI Arc port for TVs. Launching globally in February 2019, the $599 Amp will be available to professional installers in the United States and Canada starting Dec. 1, 2018. Amp is designed to fit perfectly into standard AV racks used by custom install professionals, and can power up to four speakers with 125 watts per channel--more than enough for even the most demanding set-ups. Onboard HDMI and line-in ports means TVs, turntables, CD changers, and other audio components can easily connect with Amp and become part of the Sonos system. Amp's thoughtfully designed and versatile hardware was built to power the Sonos software platform. New updates to the platform make it easy for installers to incorporate Amp into integrated smart home set-ups, including smart lighting and centralized control systems. It is also AirPlay 2 compatible, meaning music and other audio from any iOS device can be played wirelessly through Amp. And when wirelessly connected to an Amazon Alexa-enabled device like a Sonos One or Beam, Amp is controllable with voice commands. Finally, like other Sonos devices, Amp will gain new features, services, and integrations over time through free software updates, ensuring customers will get the best from their set-up for years to come. "The growth of the Sonic Internet - the convergence of paid streaming, the smart home, and artificial intelligence through voice technologies drives everything we do at Sonos," said Sonos CEO Patrick Spence. "While plug-and-play options like Sonos Beam and Sonos One are an important part of the equation, architectural sound and making it even easier to integrate with lighting and home control are equally as important. We've listened to custom installers and dealers to create Amp, a versatile product designed to be at the center of the smart home sound experience." Custom speaker connectors. A pair of threaded connections for left and right channels guarantee high-quality performance. Plus, they're standard diameter so you can remove them and use your own banana plugs. This collaboration will provide a complete offering for professionally installed architectural sound, exclusively enabling Sonos' Trueplay tuning capabilities to ensure the best sound for the space as well as the benefits of Sonos' software platform. These products, which will be sold and marketed by Sonos, will launch in early 2019. Sonos will invite partners to get certified and earn the "Works with Sonos" badge. The badge will signal to Sonos owners that companies building and innovating on our platform deliver experiences that meet the Sonos high bar for quality. For those interested in building on the Sonos platform, check out the developer portal. • Visit the Sonos website for more information. • Check out our Wireless Speaker Reviews category page. • Read Apple AirPlay 2 Is Here at HomeTheaterReview.com.